Anna Feigenbaum and Vyvian Raou report. Street-artist Banksy was in the news again with his latest artwork. 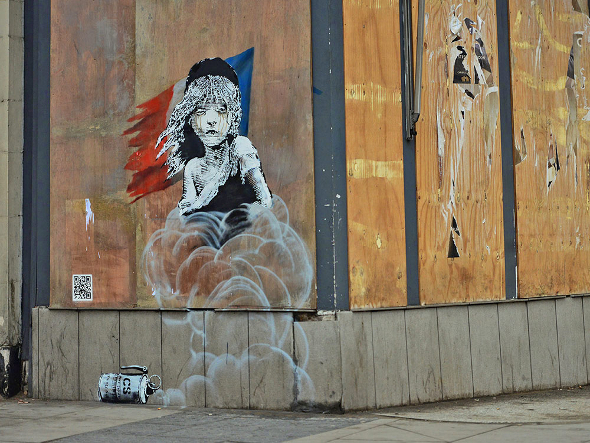 He painted the artwork opposite the French Embassy in London. In it Cosette from Les Miserables is crying and her tears are from CS gas. Like his recent artworks near The Jungle camp and around Calais, it’s about the refugee crisis. This artwork criticises the French government’s management of the situation and especially their use of weapons against the people in the camp. For the first time the artist’s work has a QR code. When you scan the code with a QR reader, it takes you to a Youtube video (https://www.youtube.com/watch?v=OQCP_inka-Q&feature=youtu.be) of CS gas, rubber bullets, and grenades fired anywhere into the camp outside Calais. We can see the video but police spokesman Steve Barbet said it did not happen. ‘It’s not in our interest to use teargas if it’s not absolutely necessary for public order. And we never use it in the camp,’ he told the Guardian newspaper. Banksy has another link to The Jungle: After his five week summer Dismaland exhibition Banksy sent the materials he did not use to the camp for shelters. Dismaland crew members went with the materials and they have so far made 12 places fro refugees to live in, a community centre, and a children’s play area.The project is now called ‘Dismalaid’. 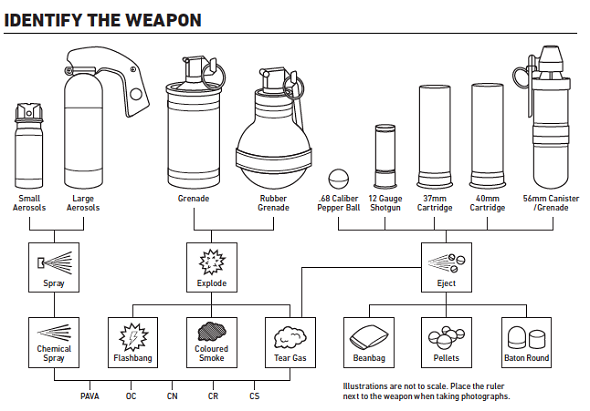 The crew members used Riot ID (http://riotid.com/), which helps civilians to identify riot control weapons. They found that the weapons were not for shooting at people at close range or in small spaces like tents, lorries, tunnels, and border zones. There are strict rules on distance and angles for firing for using these weapons. And how ‘safe’ or harmful tear gas is depends on the chemicals and how close you are, and on how much air is moving through the area. Refugee camps like The Jungle are overcrowded and have fences, wire, and guards. And so when tear gas is used, no one can escape very far. Tear gas can lead to serious injuries and even to death – for example, the killing of a 20-year-old Eritrean woman in Calais in July 2015. A car hit the young woman when she ran from tear gas the police fired at close range into the back of a lorry. The French police are shooting people with riot control weapons at close range and almost all the tear gas the Dismalaid crew found was out-of-date. Like other chemical products, tear gas has an end date and becomes dangerous. 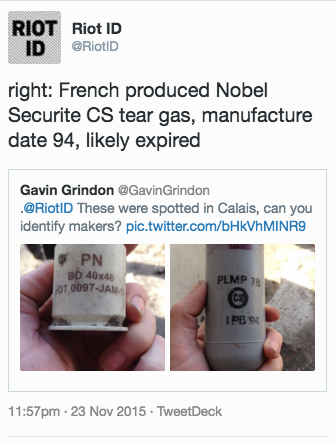 It is very difficult to find where out of date tear gas comes from and this means weapons manufacturers and governments can avoid blame. We can only imagine why they are using out-of-date, illegal weapons on people with no legal status. Has someone in a police station in Calais decided to use old weapons on people with no right to complain? Perhaps they hoped no one will find out and, even if they find out, no-one will worry. But more and more people are now sympathetic to the problems of the refugees on the small camp in Calais. The crew in Calais used Riot ID and identified tear gas from French manufacturers SAE Alsetex, Nobel Sport Securite and Verney-Carron, and US-based Combined Tactical Systems. These companies are industry leaders that export around the world – in Calais they’re making money from the bad treatment of refugees. Vyvian Raoul is a co-founder of STRIKE! Magazine and founder of Dog Section Press. This page was last edited on 30 January 2016, at 16:26.